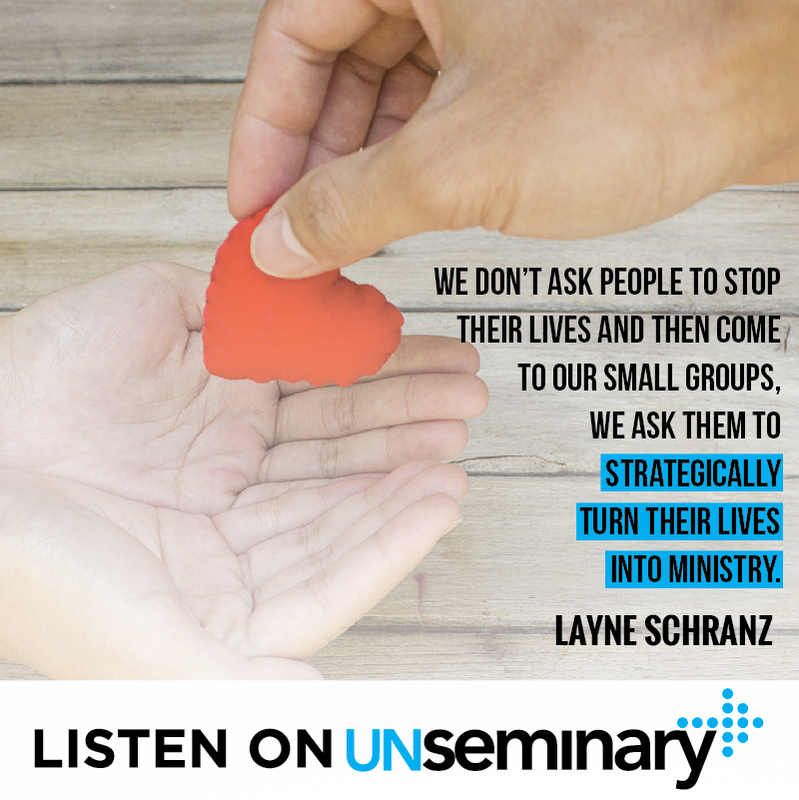 Welcome to the unSeminary podcast. Today we’re honored to have Layne Schranz from Church of the Highlands. Church of the Highlands was started in 2001 and now has 12 campuses with 31,000 members. It was started as part of an experiment among a small group of pastors and was so successful, it developed into a new model of church planting which became the Association of Related Churches (ARC). Church of the Highlands is located in central Alabama where Layne is one of the Associate Pastors, overseeing their 12 campuses and leading their Grow Network, which helps other churches with everything from structuring weekend services to developing small groups and volunteers. Connect people in relationships. // Most people would look at Church of the Highlands and think that 31,000 is a massive amount of people to get plugged in beyond weekend services. Layne explains that they work very hard to help people to connect in relationships outside of Sunday because that is where real life change ultimately happens. The beauty of the system Church of the Highlands has developed for their small groups is that it’s really effective (they have more people coming to small groups than the actual weekend services! ), completely scalable and can be used by other churches whether they have an attendance of 80, 800 or 8000. Ask your members to turn their lives into ministry. // Humans beings naturally group, Layne points out, within work and all areas of life, so it makes sense to use small groups in ministry as well. But don’t ask your members to stop their lives to join a small group, instead let them strategically turn their lives into ministry using small groups. Church of the Highlands uses what they call a “free market” system for groups, where they allow small groups to reflect the passions and interests of their people. For example, people who have a passion for working with the elderly can use that focus to minister in nursing homes. Let your members determine what their group looks like and when and where they meet instead of dictating what you think it should be. Spiritually identify and move one step. // The overriding expectation of every small group at Church of the Highlands is that the leader spiritually identify every member of that group. In other words, where is that person with God? As Layne says, one small group may have both someone who has come to church all their life but doesn’t have a relationship with God as well as a seasoned believer. Once the leader has spiritually identified where each person is at the moment, their task is to help the people in their group to take one step. That looks different for each person – it could be making a decision for Christ for one person and encouraging another to start serving at church or start leading their own group. You can learn more about Church of the Highlands at ChurchoftheHighlands.com or get resources for leadership development and more at GrowLeader.com. 00:37 // Rich introduces Layne Schranz and welcomes him to the show. 01:37 // Layne talks about the history of Church of the Highlands. 03:09 // Layne talks about his roles within the church. 04:34 // Layne talks us through the church year and explains the free market system. 09:31 // Layne talks us through the expectations of small group leaders. 11:34 // Layne talks about training small group leaders. 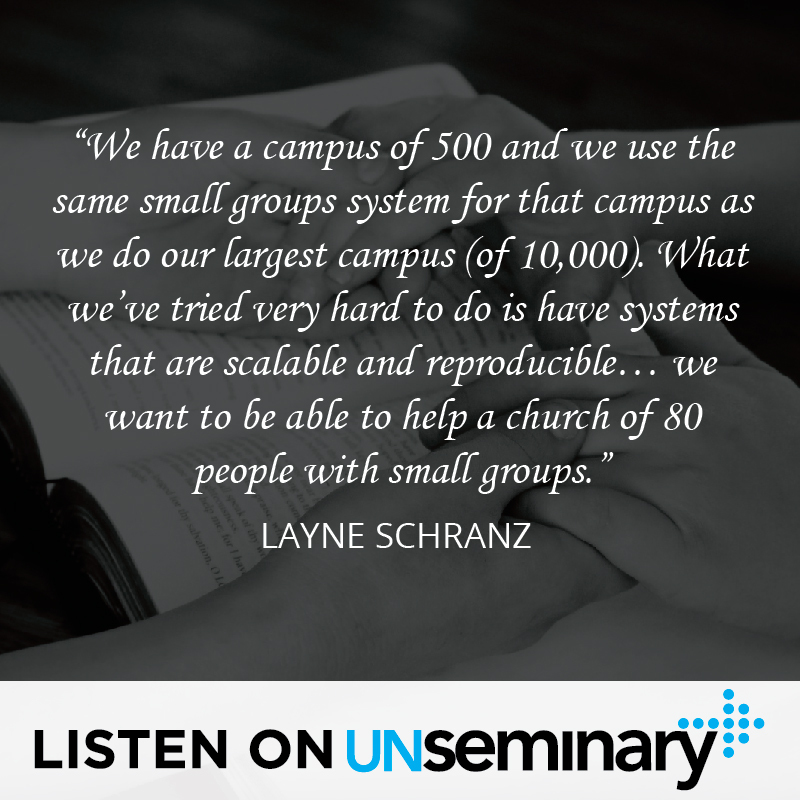 14:05 // Layne talks about keeping small groups engaged. 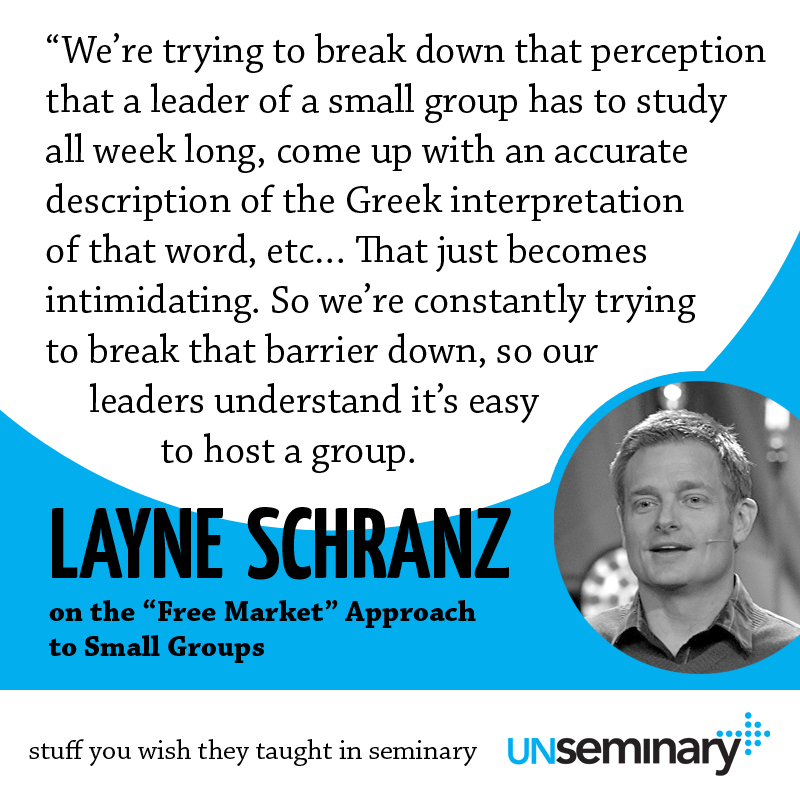 15:27 // Layne shares the challenges they face with the perception of small groups. 17:26 // Layne highlights to other pastors the importance of small groups. Rich – Hey everybody, welcome to the unSeminary podcast, my name’s Rich. I am so glad you’ve decided to spend some time with us today, I know you’ve got a lot going on at your church going into this weekend and it’s just our honor that you would take some time out, to plug us into your earbuds as we say, to wrestle through some issues today. I am honored today to have Layne Schranz with us, from Church of Highlands. This is going to be an incredible conversation. For folks that don’t know Church of the Highlands, it’s a great church, a growing church, one of the fastest growing churches, if not the fastest growing church in the country. It started just in 2001, they’ve got 12 campuses in Alabama, plus a church online experience, online campus. 31 thousand people a week and you’re like, “Who are these guys, how come I’ve never heard of them before?” I know they take a little bit of pride in that. 31 thousand people attend weekly, a great church and for me the part that’s even more impressive is over 34 hundred small groups. So we’re so excited to have Larry with us, Layne with us today, sorry, on the show. Layne, thanks for coming. Layne – You’re welcome Rich, I’m glad to be here. I’ve not been called Larry often, most people mess up my last name, not my first name. Rich – Yeah, sorry about that, I’m just so glad that you’ve taken some time out to be with us today. Why don’t you tell us, for people who don’t know Church of the Highlands, why don’t you give us a sense of the ministry of Church of the Highlands? Layne – Church of the Highlands was started by our Senior Pastor Chris Hodges February 4th of 2001 and it was actually an experiment by a group of guys, kind of led by Greg Surratt up at Seacoast Church and Billy Hornsby who is Pastor Chris’ father-in-law and another pastor named Rick Bezet and they just got together and decided to create a new model of church planting and that now turned into what you know as the ARC, the Association of Related Churches. So Church of the Highlands and New Life Church in Conway, Arkansas, pastored by Rick Bezet, were both launched on the very same day with the same plan, the same strategy and it actually worked, so we decided to do it more. We have planted now over 500 churches in the last 14 and a half years, almost 15 years, which has just been a miracle to be a part of. Church of the Highlands is a miracle in itself. Pastor Chris, I believe is just an amazing leader, but really he did a lot of work in his 20 years of ministry before Church of the Highlands, in studying proven models. So most great churches in America have had an impact on our church and he really did a good job, kind of formulating a plan and a strategy, taking the best things from the best churches and putting it together with a great vision and we’ve really followed through with that for 14 and a half years. We’ve only made things better, we’ve not changed the vision or how we implement the vision, we’ve just improved on how we do it. It’s been an amazing journey here in Alabama. Rich – That’s incredible. Now why don’t you tell us about your role there at the church, what do you do Layne? Layne – Yeah over the years I’ve kind of worn several hats. First a staff member, all your church planters know what that’s like. Pastor Chris was my Youth Pastor 26 years ago out in Colorado where I grew up. Layne – So I felt God calling me to come and join him. So we moved here to Alabama from Colorado Springs and at the beginning, when you’re the only staff member, you pretty much do everything. My main focus was starting our, what is now Highlands College, we have a ministry school and then all student ministries. Of course, I served as Associate Pastor and did whatever I could do to serve Pastor Chris. Over the years my role has narrowed. Now I oversee our campuses, as you mentioned we have 12 campuses, I oversee those. That’s what I do within Highlands, and then outside of Highlands, I lead what we call Grow, which is our training network to help other churches. So we really created a system and a network to help other church with how we do what we do. So I lead that as well. Rich – Very cool. Well you know, I think people from the outside may look in and say, “Gosh 31 thousand people, that’s a lot of people, that’s a massive church.” How does a church, like Church of the Highlands, how are you guys keeping people connected? How are you ensuring that, gosh people are coming back, they’re feeling cared for, they’re feeling looked after, they’re not just like one number in a mass audience in one of those campuses? Layne – We’ve developed a system that’s working very effectively, as you said we have 34 hundred small groups currently. We just did our semester tally and we have 38 thousand people in small groups right now. Layne – 38,752 is the exact, which is incredible. Layne – On Sundays, 31 thousand campus kids, the small group number is just adults. We’re thrilled that we have more people consistently in small groups than we have coming on Sundays, because we believe with all of our hearts that true life change happens in the context of relationship, not services. Obviously we have to have great services to connect people to God, but we also need them to be connected in relationship. So the system that we use at Church of the Highland, we just call it the free market small group system, which means we are not trying to build the church around us and our passions and our gifting and what we think [Inaudible 00:06:32] should look like or ministry should look like, we want to discover what’s in the people of the church and what that [Inaudible 00:06:40] in ministry. Everybody in your church, whatever church you have, is in a small group. Human beings naturally group. It’s probably in a group that’s not in the churches, it’s not strategically used for ministry. So we don’t ask people to stop their lives and then come to our small groups, we ask them to strategically turn their lives into ministry. So our small groups look like our people, so when we have people that have a deep passion for prayer and interception, they lead prayer small groups and when we have people in our church that have a deep passion to help the elderly in nursing homes, we have small groups that go to nursing homes. If we have people that have a passion to break down the scriptures and speak in Hebrew and sit for hours, we have groups that do that. So we let people determine what their group looks like and therefore there’s all of these benefits. When it’s what they love, they’re more apt to invite people to be a part of it. When it’s what they love, they’re less apt to burnout. Layne – So there’s this passion, there’s this energy and this excitement and then there’s the longevity because they’re getting the fulfill that’s calling on their life, not the fulfil the church is calling on the small group system if you will. Within that free market system, we’ve even followed the flow of life and the seasons of life and we break it into semesters, just like the school year. Layne – So we’ll have a fall semester we’re in right now. We’re several weeks into that and it’s going to end in the first week of December and we’re not going to try to force people to have small group every week throughout the holidays when there’s so much going on, when they’ve got business parties and family gatherings and lord knows with broken homes, there’s so many different Christmas events. So we’re not going to compete with that, so we take a break through December and then our church prays and fasts in January and at the end of that we launch small groups again and then we go through the spring semester, much like a school calendar. Layne – Those semesters, over 13 weeks for us, works great with all of the different curriculums out there. There are so many great curriculums from great leaders, pastors, ministries and so we invite people to use all of those things. Then we do a short semester in the summer. It’s not going to be as highly attended, but it’s about 6 weeks that we do in the summer. Layne – That’s a great question, so let’s clarify what we expect those groups to do. Layne – The overriding expectation of every small group at Church of the Highlands is that we spiritually identify, so this is what we ask the leader to do, spiritually identify every person in your group. So what I mean by spiritually identify, where are they with God? There’s people in your group that might not have a relationship with Jesus at all, there’s people in your group that maybe have been in church for 20 years and they’re at very different places but they’re in the same group. So spiritually identify where they are and then that semester help them move one step. So even as a pastor, I’ve had some guys, I’ve led men’s small groups, I was at one this morning that I’m not leading, I just went and attended that small group and there are people with issues and problems and even as a pastor, if I feel like I have to fix their life, if they’re going to be in my small group, if I’ve got to disciple them and make them a fully devoted follower of begin to feel this pressure and this weight, discipleship, like I’ve got to fix them and it can be very intimidating, very hard and very discouraging because people usually take time to work through. So we want to figure out where they are. So the unsaved, we want that one step is let’s hope and let’s pray and let’s work for them being saved. Rich – Make a decision, yeah. Layne – The person that’s been in church for 20 years, I’ve got a different move one step for that person, I want them to become a leader for their own small group. Layne – We can create 9 different people and stories and I can tell you all the… but that’s our overriding expectation. Rich – Now how are you equipping your leaders for those next steps? Do you have kind of a training, what are you doing to ensure that they understand? I think that’s a powerful idea, a part of what I love what you’re doing there is you’re not saying, “Hey do it all,” it’s like what is the one thing that we’re hoping to take everyone? I think that’s a powerful idea, but how do you equip your leaders to be able to wrestle through, what are those one steps that people could take? Layne – We have a small group leaders training, this might unsettle some people out there and I know I’ve had enough conversations with pastors to know this freaks them out, but our small group leaders training is about an hour and 15 minutes. Layne – And it’s one time. There is no more training, that’s it. Layne – So we have a very simple assimilation process into our church. If you’re a visitor for the very first time at Church of the Highlands, we’re going to encourage you to go Growth Track, which is just 4 weeks, which will then connect you to God, connect you to the church, discover your gifts and then get you on the team, so you can make a difference. So it’s at that 4th week that you can choose, I want to be an usher. I want to be a greeter. I want to be on the worship team or I want to be a small group leader, you would just go to this hour and 15 minutes small group leaders training. But then when you begin to lead a small group, you’re going to have a coach. Layne – Coaches are other volunteers that have led small groups in the past and we know that they’re going to learn more, not in another leadership training and taking more notes and listening to a [Inaudible 00:12:37] but they’re going to learn more from a problem. Layne – I had a guy in my group that says he’s depressed. Okay what do I do, I’ve never met anybody depressed, how do I handle that? Through the coach. Or I had a young lady said that she’s going to kill herself tonight and if they didn’t know who their coach is and have that communication, so we’re going to teach them, for the rest of their years as small group leaders as coaches. So even my own life, that’s how I learned in ministry, as a teenager serving in Pastor Chris’ youth group. It was when he gave me the freedom to lead a group and then when problems arose, that’s when he would teach me. So that’s kind of our system. Rich – Yeah that’s, I think, a critical insight there, that adult learners, really only learn, it’s just in time learning, they only learn when they have to apply it. So, using those two example, you could have a class on saying here’s what to do when someone says that they’re depressed, that’ll just go in one ear and out the other, for most people. There’s a small segment of people who will learn like that and those are the people that write those classes, but that’s actually not the vast majority of people. Now folks are busy, people have got a lot going on in life, they’re wrestling with trying to figure out how do we just do life. How is it that you’re getting people to engage on a consistent basis in groups? I hear that a lot from churches, it’s like, people are just too busy to be able to do 2 sessions, 2 x 13 week sessions and then maybe some do 6 in the summer, that’s a lot. Tell me how you’re helping people engage. Our participation level, obviously by the numbers I shared is very high, but I vote it’s because of that free market, giving them freedom to meet at 6 in the morning or 7 at night and meet in their house or meet at a Panera Bread, it doesn’t matter. Rich – Now every system, every leader knows that they’re picking an approach, in some ways you’re picking the problems you want to have. What would you say are the one or two areas where your approach has provided a bit of grind that you’re still trying to figure out, you’re still learning, still wrestling through, trying to figure that piece out? Layne – Yeah I think the constant grind, if you will, is probably not as much against what we’re doing but breaking down people’s perception of what we’re doing. There’s the perception of a small group as kum bay yar and this perception will keep you from getting leaders. So let’s look at it from that standpoint, obviously every church would want more small group leaders, so many people in the church are afraid of the word ‘leadership’, and I get that, that sounds intimidating. Really we’re trying to break down that perception that a leader of a small group has to study all week long, they have to come up with 3 points and a poem, an accurate description of the Greek interpretation of that word in Romans Chapter 8, whatever. So that just becomes intimidating, so it’s hard to get leaders when they have a perception that a group is them teaching and our groups are not that at all. So we’re constantly trying to break that barrier down, so our leaders understand that it’s easy to host a group, even use that language, “Hey we just need you to host a group. If you can push play on a DVD player, you can lead a marriage group and it will change people’s lives.” So it’s just breaking down that barrier. The same barrier for the people in the church that you want to connect to a small group and many of them have a perception, “What is a small group? What is that? Am I going to stand in a circle and hold hands with people? Are we going to sing? Is it going to be weird? What about that one lady and what’s she going to do?” So they have these perceptions and so I love to say, “Just because you got a bad haircut doesn’t mean you stop getting haircuts, because you had a bad experience in a small group…, a lot of people have had bad small group experiences, it doesn’t mean you just need to kick it to the curb, you need to go after it. So really, I think our challenge is just dealing with people’s perception. Rich – Very cool. Well anything else you want to share with people that have been listening in, this has been a great conversation so far, before we move on with the episode? Layne – I think something that Pastors really need to hear, senior pastors need to hear that, if you’re wondering why it’s so successful at Church of the Highlands, it’s because we’re not a church with a small group ministry, we are a church of small groups. So it’s not a department, it didn’t take off when we hired the right guy. I think most pastors think, “If I hire the right small group pastor everything will be fixed,” and it just doesn’t work that way, it starts at the top, everything rises and falls on leadership. Pastor Chris, in our early years, was leading as many as 3 small groups a week. This day he still leads small groups, he talks about small groups, he Tweets about small groups, it comes out in his messages. Every staff member at Church of the Highlands leads a small group, that’s what we do as volunteers. People in our church, they work full time jobs, and they volunteer and lead small groups, well so do we. So my wife and I lead a college age small group on Monday night in our home and we love it. So it’s throughout our whole culture. So a staff member at Highlands not leading a small group would be like a staff member at Highlands not coming to church. Layne – It’s that important to us and I think pastors need to grab a hold of that if they really want to see small groups working in their church.